I'm so glad you stopped by for another wonderful color challenge from The Play Date Cafe! Thanks to everyone who gave last weeks "color horribilis" a go, you all created such wonderful pieces with that challenge! This week Julie Ranae is your color hostess, Andrea is joining us as our new Private Blend Designer and we also have Sankari Wegman as our Guest Designer! Here's Julies Color Story, aren't those colors pretty! I pulled out my card stock colors: Eggplant, Sahara Sand and Mustard, as I thought they were a close match to the photo. Picked an image to use, then decided on a Technique to add color to my image. What's your creative process? Don't adjust your screen....when looking at the color story, I actually say an eggplant/purple shade - thus the color of my card stock and Wisteria BG paper. I stamped the Paper Bag Studios image Simple Pleasures in Black Archival. To color the image, I used the Spectrum Roll Technique from an older Technique Junkie Newsletter - using Eggplant and Mustard Inks, spritzing the Brayer with pearl Glimmer Mist. 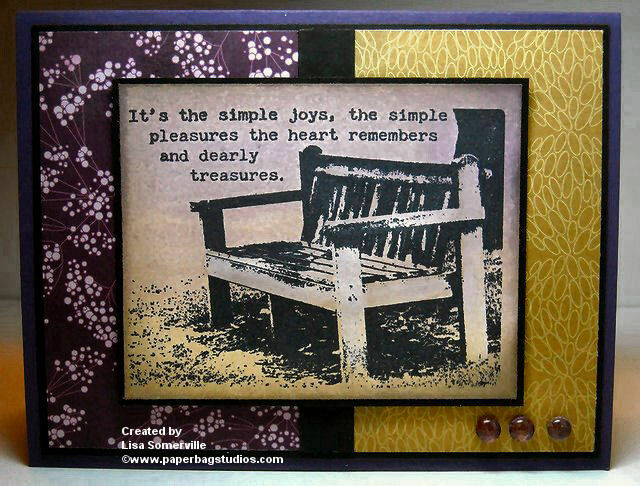 Once dry, I sponged the edges with Pumice Stone Distress Ink, then colored the bench in Pumice Stone using an H20 Brush. 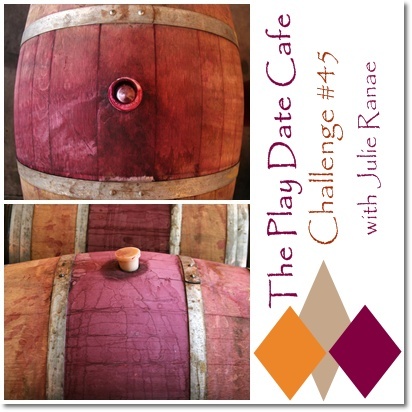 We'd love for you to play along with this weeks challenge at The Play Date Cafe, you can find all the details here on how to enter. If you upload to any online gallery please use keyword PDCC#45 so we can find your creations! Beautiful image and background papers. (Some of my favorites) Love the technique on your background. Great card Lisa, I love the colors! This is just such a wonderful card! I love the colors, and I love the papers you chose! And that image w/ the sentiment! So perfect! Love those shades of purple and mustard, very appealing together! 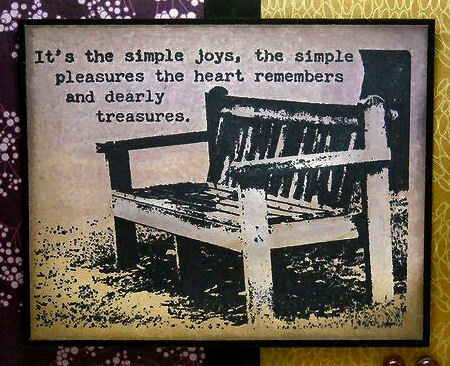 And that sentiment is wonderful! You give super tutorials on your blog, thanks for sharing with us! This is great Lisa, it looks really peaceful (if that makes sense!) Fab technique! I love this paperbag studios image, such a great one to use with these colours - fab!! Beautiful, Lisa. The colors, the print paper, and the image all work so well together. What a omfort that card is! Beautifully done, so artistic and the sentiment is wonderful! Lisa, this is so gorgeous. I love the stamp of the swing. Oops, I do need to use my glasses more. I see now that it isn't a swing, it's a pretty stationary seat, I think. Anyway, I like the stamp. This is gorgeous. I wasn't inspired by the challenge colours, but having seen this I think I'll have to give it a go. Thank you.